I have found an interest in black garlic and like many things I start researching I have found a desire to make my own. The research I have done has yielded recipes that start at aging the garlic in caves for months on end and end with custom built boxes with lights, fans, thermostats, and viewing windows. The best, or most common I should say, recipe I found was to keep the garlic at 140 F for 40 days. While simple this is not the easiest task to accomplish. First of all what is the heat source? Remember you are not going to be able to use it for 40 days. Second what heat producing equipment can stay on for 40 straight days with no problems? 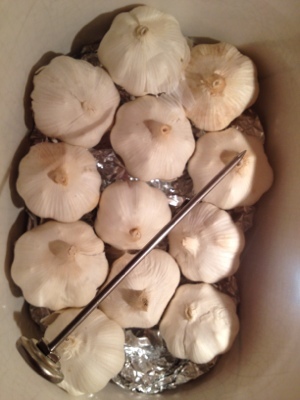 After testing my crock pot, which we hardly ever use, I found that on a low setting it will hold a temperature range of 138 F to 160 F. So with 12 head of garlic I am starting the 40 day process of black garlic. I placed some aluminum foil on the bottom of the dish in an attempt to keep the garlic from directly touching the vessel itself. Humidity seems to also be a dilemma is the production of black garlic in that you don’t want to lose any moisture as the garlic ferments. I have covered the top of the pot tightly with cling film and inserted a thermometer so I can monitor the temperature. The garlic has been on the heat for all of two hours now and all I can smell is roasting garlic in the house. Sounds very interesting. Let me know how the end result turns out.